Design method frameworks provide an overview of the process and give suggestions of how design can (or should) be approached. 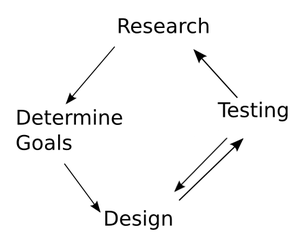 This includes researching user needs before creating solutions and testing prototypes before investing lots of time. They might be particularly useful for beginners who can use them as a guide for their design work. But these models may not match what designers actually do: Having a model of how a process can or should be like is one thing, putting it into practice is another. Thus it would be interesting to know if these suggestions are followed and if not why. The study is not big, but it fits into the findings concerning other creative and problem-solving activities: Mechanical Engineering, Circuit Design, Architecture etc. In these fields, studies suggest that design does not happen in clear cut, sequential steps. In particular, the problems which are solved are often seen as »moving targets« : The problem which is to be solved is often only preliminary defined, and not exactly depended on the external requirements (Client x needs y) but co-evolves with the solutions . So design is highly opportunistic and it is opportunistic not just in areas where something should look stylish but in seemingly »hard« areas like mechanical engineering or programming . The usefulness of models is thus debatable: They may help (novice) designers to include all necessary steps in a meaningful order, so that they don’t get stuck (e.g. in deciding which colors to use before they know if they want to design a magazine or a website)  but on the other hand they may wrongly suggest that steps in design are not interwoven. In addition, following a model may add mental bookkeeping costs  (e.g. we are now in the prototyping phase with part x but part y is still… so we need…). Design method frameworks can help (novice) designers to give their project a meaningful structure. But to be more useful they should consider as well the opportunistic and and intertwined kind of work that seems to be part of most design practice. Helen Sharp, Nicole Lotz, Richard Blyth, Mark Woodroffe, Dino Rajah, and Turugare Ranganai. 2013. A protocol study of novice interaction design behaviour in Botswana: solution-driven interaction design. In Proceedings of the 27th International BCS Human Computer Interaction Conference (BCS-HCI '13), Steve Love, Kate Hone, and Tom McEwan (Eds.). British Computer Society, Swinton, UK, UK, , Article 18 , 10 pages. Cross, Nigel: Design Thinking : Understanding How Designers Think and Work. Bloomsbury Academic, New York, 2011. ISBN 978-1-847-88846-4. Guindon, Raymonde. 1990. “Designing the Design Process: Exploiting Opportunistic Thoughts.” Hum.-Comput. Interact. 5 (2): 305–44. Fricke, Gerd. 1996. “Successful Individual Approaches in Engineering Design.” Research in Engineering Design 8 (3): 151–65. doi:10.1007/BF01608350.